Malaysia and Singapore, two nations embracing multiculturalism within the perimeters of a post colonial mindset. Both nations exhibit a post colonial mindset in their government structure. This can be referred to as racial governmentality, and is defined as a pressing issue for Malaysia and Singapore by Goh and Holden in Race and Multiculturalism in Malaysia and Singapore (2009). This ideology results in the lack of recognition for minorities living within Malaysia and Singapore, and allows the majority ethnicities to thrive. Through the examples provided by Goh and Holden, the forgotten people of Malaysia and the issues they face are exemplified. Racial Governmentality is defined as a system that allows one race – amongst others within a nation- to thrive whilst the others are left without recognition, representation, and very few resources. Goh and Holden highlight the origins of racial governmentality in Malaysia by explaining the way in which the British segregated the population socially, economically and geographically. The Chinese were “placed as commercial middlemen”, whereas the Malay’s were “confined to the fields” and Indians “imported as municipal; and plantation laborers”. (Holden, Goh. 5) Goh and Holden highlight this societal organization as important pre-text to explaining the way racial governmentality operates today. This organization and separation of races highlights the post colonial mindset that Influenced this social separation and categorization. This organization lead to the “hardening of racial categories” (Holden, Goh, 5) which is what contributes to Malaysia’s current system of racial identification. Malaysian citizens have the option of identifying as Chinese, Malay, Indian or Other. This system of organization excludes the mired of other ethnicities that inhabit Malaysia, specifically the native peoples of the land – the Orang Asal. The exclusion of the Orang Asal within Malaysia’s system of identification highlights the lack of recognition of indigenous peoples – a expected effect of colonial and post colonial attitudes. The marginalization of the Orang Asal exemplifies the significance of racial governmentality and its roots in colonialism as Malaysia gives priority to other ethnicities, even over the native people of the land. Goh and Holden’s points on racial govermentality illustrate the everlasting impacts of colonialism and exemplify the meaning of a post colonial society through their analysis of Malaysia and Singapore’s establishment and organization. Furthermore, Malaysia’s system of identification highlights the way in which racial governmentality operates and results in the oppression of other races. In the case of multicultural relations in Singapore and Malaysia, the age-old adage holds true: history repeats itself. In the introduction to Race and Multiculturalism in Malaysia and Singapore, Goh and Holden argue that the post-colonial racial governmentality in Southeast Asia continued to exist following independence (2009). Additionally, the frameworks that shaped colonial racial governmentality were set in place by pre-existing racialization. The social constructs that form post-colonial racial governmentality are both influenced by pre-colonial racial constructs and the aftershocks of colonial rule, and continue to exist into the present. This evolution of racial governmentality is interesting because it illuminates how European colonizers have historically enforced racial systematization in their colonies. However, this systematization was also sometimes pre-existent in colonized nations. Racial governmentality is defined as a governmental system in a multicultural society that primarily focuses on the needs of a specific racial group. Goh and Holden state that the enforcement of racial separation in colonized societies was “not invented by colonial powers […] but rather built on and radically transformed pre-existent social imaginaries” (5). Here, Goh and Holden define racial governmentality as a system enforced by colonialism. However, the framework for this system was laid in place my pre-existing racial systems. Additionally, racial governmentality has continued to exist post-colonialism in Singapore and Malaysia. Goh and Holden state that “colonialism’s racial governmentality was something that could not easily be left behind by the new national state” (6). Goh and Holden continue to describe the state of the People’s Action Party in Singapore and the United Malays National Organization in Malasyia (6). These organizations sought to reinforce racial primacy in their respective countries through civilian effort (6). In the 1970s and 1980s, similar movements took root as the Malaysian government enacted policies favoring “sons of the soil” (7). The fact that racial separation was often in place before colonization, however, should not be taken to dispel the role that colonization played in racial governmentality in Singapore and Malaysia. Both foreign and domestic influences have played a role in shaping racial governmentality in Singapore and Malaysia. In conclusion, racial governmentality has roots that extend back to pre-colonial times in Singapore and Malaysia. However, colonial powers amplified these roots, and following colonization, Singapore and Malaysia continued to foster policies and movements that favored racial governmentality. As Goh and Holden state, “historical consciousness plays a major part in the formation of our identities and the definition of multicultural possibilities” (8). The histories of Singapore and Malaysia in terms of multicultural relations shape the present. These histories, furthermore, have influenced the presence of racial governmentality in these nations. Historian often say history repeats itself until we learn the lesson that is meant to be learned, and we make the necessary changes to become a more globally accepting, equal, and interconnected society and world. One way history has been repeating itself for centuries is with the way in which we categorize people.Daniel Goh and Philip Holden show the continuance of racial structures that promote “institutionalized colonial identities” (3) which turns into a different form or “new racism” (2) in our society decades after a country established its freedom from their colonizers in their book, Race and Multiculturalism in Malaysia and Singapore (2009).Goh and Holden also acknowledge the damaging effects of this continuance and of the “new racism” it forms. To start of, Goh and Holden states that these two countries government are, “shaped by a racial governmentality” (1). Racial govermentiality first started when British assigned labor systems in the countries that they colonized such as Malaysia and Singapore. The British recognized any progress socially, economically, or culturally as being tied to your race. Therefore, racial structures were created that positioned a person’s race and ethnic identity ahead of their Singaporean or Malaysian identity. This created “institutionalized colonial identities’ (3), because years after these colonized countries such as Malaysia and Singapore fought for their freedom, the effects and racial structures stemming from a racial governmentality that the British practiced in these countries remained. Goh and Holden essentially make the argument that race and multiculturalism function as a continuance of “institutionalized colonial identities” (3) that creates “new racism” (2) in countries like Malaysia and Singapore whom were colonized and later established their freedom.This means that the act of freedom from colonizers is not enough, there has to be more actions taken to rectify the structures they left. Malaysia and Singapore are examples that a colonized country still relies on the established government by British colonizers even in a postcolonial and multicultural state. One way we see this argument shown as accurate is through the use of Robert Hefner’s collection of essays (2001). Hefner’s works showcases the, “investigation of multiculturalism in Singapore, Malaysia and Indonesia in the production and reproduction of precolonial, colonial and postcolonial pluralism”(2). This goes to show how “new racism” stems from the precolonial and colonial decades of history, because the “institutionalized colonial identities” established by the British are still present today in countries that have postcolonial pluralism. I found this to be revealing because often when people think of a postcolonial or multicultural/pluralistic country, they think of it as a melting pot such as with the United States. The terms or view point of multicultural or melting pot often gives of the impression that the country and its citizens are equal, diverse, and legally understanding of everyone. However, that is not true because we see the effects of the race systems from colonial days that still show face in the legal, social, and cultural aspects of our society today. For example, in Malaysia, the “politics of recognition” (3) shows how one must navigate race to have access to resources because it is not evenly distributed among citizens. This is similar to America where the race you are born into already has serious stereotypes accompanied with it. For Blacks, this is often shown through the wealth and economic gap that shows how minorities like blacks are more likely to live in poorer segmented neighbors. History repeats itself as we learn it, until we understand it enough to change it. The understanding that one has control of their own fate is then seen as only possible if we as a society decide that we want to change our fate and take another route not tied to our colonizers. Daniel Goh and Philip Holden are taking the necessary steps in learning the colonial history of Malaysia and Singapore, and exposing the recurring effects British colonizers have had on the land. They are also arguing for the necessary change in the ways we use “institutionalized colonial identities” (3) because it is creating a system for “new racism” as seen in other countries like America who went from slavery to Jim Crow laws. It is interesting how history has been repeating itself, but it is also revealing because Goh and Holden are revealing to us how to change the continuance of a racially charged and oppressive history. 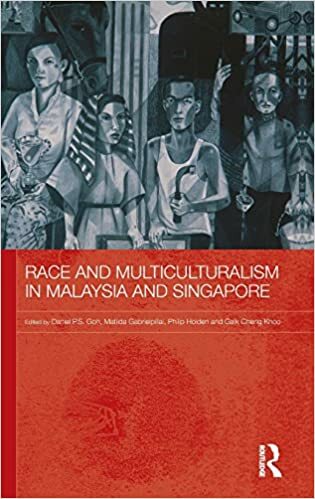 In the text, “Race and Multiculturalism in Malaysia and Singapore,” (2009) Daniel Goh and Philip Holden discuss multiple main ideas but the one I want focus on is, “institutionalized colonial racial identities” (3). According to Goh and Holden, “institutionalized colonial racial identities” (3) was imbedded in social political aspects of Singapore and Malaysia because it influenced how people understood identities of others and themselves. Unfortunately it influenced favoritism of certain cultural groups over another, so depending on a person’s culture, they received favoritism or were disregarded. The objective Goh and Holden make, is that different cultural identities should have “equal value and worth,” (3). And to do that there needs to be a rearrangement of, “colonial and postcolonial cultures” (4) through the government. The government is categorized into, “civil groups, citizens and residents as postcolonial actors”, (4) but the way the cultural racial groups are set up makes it difficult to change things so they have to settle for compromising, “institutionalized colonial racialization,” (3) until they can reform it to a new multiculturalism where one race is not ranked higher or lower than another. This led to the grouping of labor for people based on the racial and cultural group they belonged to in Malaysia under British rule, “Thus Chinese were placed as commercial middlemen aliens, Malays and Indonesian migrants confined to the fields as indigenous peasant smallholders, and the Indians imported as municipal and plantation labourers,” (5) depending on the rank a racial group has the labor can be bad. Racial categories relates to America too because both America, Malaysia and Singapore incorporated the same tactics, which are grouping specific racial groups in categories to solely control and regulate their lives, for example in Malaysia, “new immigrant communities were segregated geographically, socially and economically from the local population,” (5). America is perceived as a melting pot of cultures that are so diverse and live in harmony but in reality, America was built on racist fundamentals, is not what it was made out to be which is a country that is accepting and welcoming of everyone no matter how different they are in regard to race and culture. America has strategically done things to keep certain racial groups more controlled such as, segregation in schools and the busing system. Overall, these countries have done everything in their power to put certain racial groups above others. Goh, Daniel P.S. and Holden Philip. Race and Multiculturalism in Malaysia and Singapore. New York, Routledge, 2009.